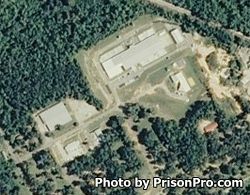 George-Greene County Regional Correctional Facility is located in Lucedale Mississippi. It is responsible for housing 280 adult male state inmates and 168 male and female pre-trial detainees. State inmates at this prison can participate in programs that allow the inmates to earn a GED. In addition inmates can receive discipleship training on seven levels, and can take life skills courses. Visiting days will depend on what housing unit the inmate is located in. All visitation occurs on a bi-weekly weekend schedule. A-Zone inmates have visits on the 1st and 3rd Saturday from 8am-11:30am. ​B-Zone inmates have visits on the 1st and 3rd Saturdays from 12:30pm-4pm. C-Zone inmates have visitation on the 2nd and 4th Saturday from 8am-11:30am. D-Zone inmates have visiting on the 2nd and 4th Saturday from 12:30pm-4pm. E-Zone inmates have visiting on the 1st and 3rd Sunday from 8am-11:30am. F-Zone inmates have visiting on the 2nd and 4th Sunday from 10am-11:30am. G-Zone inmates have visits on the 2nd and 4th Sunday from 10am-11:30am. H-Zone inmates have visiting on the 2nd and 4th Sunday from 12:30pm-2pm. I-Zone inmates have visits on the 2nd and 4th Sunday from 2:30pm-4pm. J-Zone inmates have visiting on the 1st and 3rd Sunday from 12:30pm-2pm. K-Zone inmates have visits on the 1st and 3rd Sunday from 2:30pm-4pm. L-Zone inmates have visiting on the 2nd and 4th Sunday from 8am-9:30am. CSTU inmates have visiting on the 2nd and 4th Sunday from 12:30pm-2pm.